This paper examines different concepts of a ‘warming commitment’ which is often used in various ways to describe or imply that a certain level of warming is irrevocably committed to over time frames such as the next 50 to 100 years, or longer. We review and quantify four different concepts, namely (1) a ‘constant emission warming commitment’, (2) a ‘present forcing warming commitment’, (3) a‘zero emission (geophysical) warming commitment’ and (4) a ‘feasible scenario warming commitment’. While a ‘feasible scenario warming commitment’ is probably the most relevant one for policy making, it depends centrally on key assumptions as to the technical, economic and political feasibility of future greenhouse gas emission reductions. This issue is of direct policy relevance when one considers that the 2002 global mean temperatures were 0.8± 0.2 ∘C above the pre-industrial (1861–1890) mean and the European Union has a stated goal of limiting warming to 2 ∘C above the pre-industrial mean: What is the risk that we are committed to overshoot 2 ∘C? 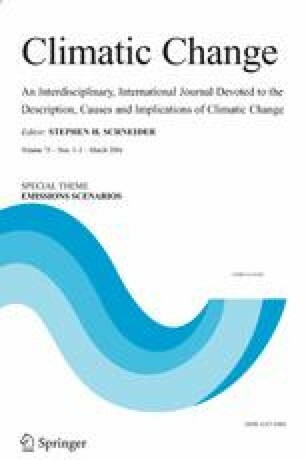 Using a simple climate model (MAGICC) for probabilistic computations based on the conventional IPCC uncertainty range for climate sensitivity (1.5 to 4.5 ∘C), we found that (1) a constant emission scenario is virtually certain to overshoot 2 ∘C with a central estimate of 2.0 ∘C by 2100 (4.2 ∘C by 2400). (2) For the present radiative forcing levels it seems unlikely that 2 ∘C are overshoot. (central warming estimate 1.1 ∘C by 2100 and 1.2 ∘C by 2400 with ∼10% probability of overshooting 2 ∘C). However, the risk of overshooting is increasing rapidly if radiative forcing is stabilized much above 400 ppm CO2 equivalence (1.95 W/m2) in the long-term. (3) From a geophysical point of view, if all human-induced emissions were ceased tomorrow, it seems ‘exceptionally unlikely’ that 2 ∘C will be overshoot (central estimate: 0.7 ∘C by 2100; 0.4 ∘C by 2400). (4) Assuming future emissions according to the lower end of published mitigation scenarios (350 ppm CO2eq to 450 ppm CO2eq) provides the central temperature projections are 1.5 to 2.1 ∘C by 2100 (1.5 to 2.0 ∘C by 2400) with a risk of overshooting 2 ∘C between 10 and 50% by 2100 and 1–32% in equilibrium. Furthermore, we quantify the ‘avoidable warming’ to be 0.16–0.26 ∘C for every 100 GtC of avoided CO2 emissions – based on a range of published mitigation scenarios. Hadley Centre: 2003, ‘Climate Change – Observations and predictions – Recent research on climate change from the Hadley Centre’, Exeter, Met Office Hadley Centre: 16 available at http://www.metoffice.com/research/hadleycentre/pubs/brochures/2003/global.pdf. Wigley, T. M. L.: 2003, ‘MAGICC/SCENGEN 4.1: Technical Manual’. Boulder, Colorado, UCAR – Climate and Global Dynamics Division available at http://www.cgd.ucar.edu/cas/wigley/magicc/index.html.